Sapphire AV have a reputation for manufacturing quality products and backing this with industry leading support levels, including a standard warranty of at least 3 years on all our items. We have knowledgeable staff on hand to answer your questions. If you want to purchase container volume from China we can arrange factory visits to Guangzhou, Guangdong, China or our UK manufacturing in Newport, South Wales np109FQ. You have very little stock costs. Replacement stocks are immediately available in the EU. 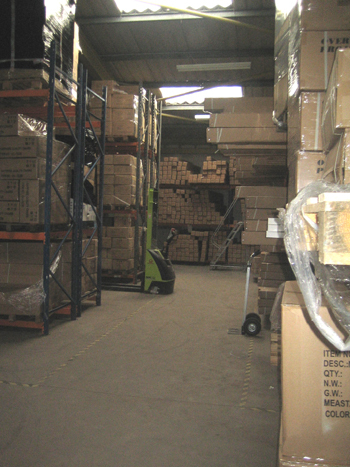 We have thousands of items in stock (26,013 items in September 2010) for next day delivery from our UK warehouses which, supply a large number of audio visual installers and distributors. The Directors own five units amounting to 18,000 sq feet which Premier Group (UK) Ltd occupies. If you are visiting just look for the cream and red buildings when you pass the Avana Bakeries entrance on the Industrial Estate. You have the support which is based on GMT (UK) time. We have up to 5 - 40 or 45 foot containers a month which means we always have large stocks of most key items. Interactive Technology products are made to order in the UK on a short timescale. You are welcome to call on us however we need a call first to ensure we prepare items for you before you arrive. Our modern industrial units ensure that all stock is maintained in a clean and safe environment, ensuring that they reach you in good condition. We have many years experience of shipping items and all large screens and bulky items get extra packaging to ensure a safe journey. Obviously we do get some damages based in the volume we ship. However you will find if there is a problem we are easy to deal with and will quickly arrange a replacement item. We do not ask you to have to complete an online RMA process like many companies as we want to ensure if something goes wrong that we oversee it and ensure the swap out happens as planned. Copyright www.Sapphireav.com. All Rights Reserved.